The very idea of a history-minded walk around SoHo is depressing. The buildings are there, certainly. Cast-iron masterpieces are in surplus. But nothing of great value lives inside (great cost, yes). No ancient merchants. No artists. No tradition. Just commercial chain-store mundanity. Rough and tumble SoHo once teemed with industry. In the 1970s and 1980s it found a new pulse as a haven for art and artists. Shopping and restaurants followed, which was fine, as long as the culture remained. But the artists decamped for Chelsea in the 1990s, leaving only Pottery Barn and J. Crew to bask in the reflected glory of the Belgian Blocks. There's very little living history to choose from here, but what there is I list below. JOE'S DAIRY: For whatever reason, the greatest density of old (mostly Italian) SoHo institutions lies on Sullivan Street, beginning with Joe's Dairy, an ancient cheese shop near Houston Street. They make sandwiches, too. The Catholic church ST. ANTHONY OF PADUA is across the street. It was built in 1888 and remains the center of Italian life in this neighborhood. PINO'S PRIME MEAT: Just across the street and down the block is Pino's, a small butcher that does things the old way. There's been a butcher here for a century. Pino Cinquemani began his occupation of the address in 1990. He obviously didn't change much about the look of the place. PORTO RICO IMPORTING COMPANY: Turn left at Prince Street and then right on Thompson for half a block. The 101-year-old, family-owned Porto Rico has four shops in Manhattan, but this odd, narrow, aging storefront is the charmer for me. FAMOUS BEN'S PIZZA: Continue south. Ben's has been at the corner of Spring and Thompson for, well, not forever, but what seems like forever. It's a good source of an inexpensive snack in ritzy Soho, and there's something about the fresh tomato and onion Sicilian slice. Without it, SoHo doesn't really have a neighborhood pizzeria, which would be a crime. No neighborhood should suffer that. MILADY'S: Head back north to Prince and cross Thompson. On the corner is a rare bar and restaurant in Soho that won't piss you off with its shallow trendiness. Cheap, too. 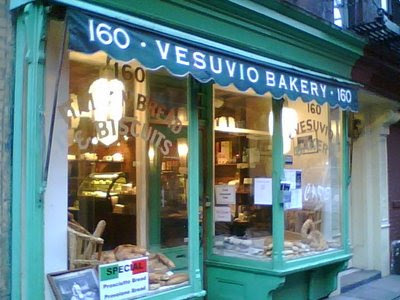 VESUVIO BAKERY: Next door to Milady's, painted as bright green as a spring leaf, is Vesuvio. Who knows what's going with this classic bakery, one of the ten best-preserved in the city (on the outside, anyway). It's been shuttered for months, after a brief life as a cafe. In its glory days, it was owned by community activist Tony Dapolito, the unofficial "Mayor of Greenwich Village," who died in July 2003. It had a spartan glory, bread in the windows, bread inside. No decor. The business was bread and Vesuvio was all business. Still nice to look at, though. FANELLI'S CAFE: Walk west to the corner of Mercer. As far as I'm concerned, this 1847 tavern is the heart and soul of SoHo. It had a phase as a speakeasy during Prohibition. The Fanelli family owned it from 1922 to 1982, and the dark-wood bar, which serves food and is always crowded, retains the name. Everything about the place, from the neon sign, to the diagonally framed entrance, to the bathrooms, is special. A place to while the day away in. DEAN & DELUCA: OK, you can hate me for it, but I'm going to include the ultimate Yuppie and tourist hangout on this list, only because, as far as culinary history in America is concerned, the shop truly is historic. Nobody was doing the fancy-schmancy-artisan-made-cheese-oil-and-everything jazz before Joel Dean, Giorgio DeLuca, and Jack Ceglic the idea hatched the back in 1977. And everyone thought they were crazy to hang out a shingle in nasty old SoHo. Sure, D&D was sort of like Patient Zero when it came to the malling of SoHo. They deserve the rap for that. But that doesn't discount what they accomplished. The building dates from 1883. THE PUCK BUILDING: Continue on to Lafayette and turn right to Houston, crossing cool little JERSEY STREET. The Puck, to me, is one of the grand architectural paperweights that keeps the changing canvas of SoHo in place. A wonderfully beautiful Romanesque Revival landmark, it was built between 1885-1893. Puck magazine gave it its name. Spy magazine carried on Puck's tradition here in the late '80s. The gold statue of the mocking Puck is just the right antidote to the hoards of clueless consumers forever milling below. THE BROADWAY AND BROOMS PANTHEON: Walk back to Broadway and head south to Broome. At the corner is a grand cast-iron building. This was built as the E.V. Haughwout Building. Many critics consider it the crown jewel of cast-iron architecture. But I mainly point it out because it was here that Elisha Otis—who gets my vote for one of the most human-life-changing individuals of all time— installed his first passenger safety elevator in New York City. Think of it. THE PERFORMING GARAGE: Walk west on Broome to Wooster and jog left for a bit. The faceless, undistinguished brick structure at No. 33 is The Performing Garage, long home of American's greatest avant garde theatre company, The Wooster Group. Surely, Spalding Gray haunts it now. KENN'S BROOME STREET BAR: Back to Broome and left to West Broadway. Kenn's was a pioneer in wild SoHo back in the 1970s, setting up shop in this 19th-century building, a former hotel when SoHo was the northern edge of the city. It remains what it was then: cozy, relaxed, a nice neighborhood bar. Next door is the CUPPING ROOM CAFE, which also dates from the 1970s, but is a little more upscale. EAR INN: After passing all those twee boutiques and chain outlets and pricey restaurants, and fighting your way through the tourists, you'll want a drink. So get to Spring Street and head as far west as you can go (almost). The weirdly named Ear Inn is old, old, old. There's been a bar here forever. It's blue collar and they don't like cell phones. There's food, too, but mainly there's enough old-world atmosphere to choke a salty sea captain. Thank God. Brooks: Quite a few errors here. Artists did not decamp for Chelsea in the 90s. Most of the galleries may have, but certainly not the artists. In fact, most of the spaces above the ground floor are residential, not commercial or retail, as you stated, and many of these residential lofts, at least half, have artist residents (according to a survey by Columbia University). No artists ever lived on the ground floor, the spaces currently occupied by high-end retail. There was always retail (or wholesale) on the ground floor, never an artist in residence. The reason why many artists remain is that most of these residents own their co-ops and see no reason to move. Where would they move to, and who wants to pay the capital gains? The others who do not own are protected by the 1983 Loft Law, a form of Rent Stabilization. Many, many are paying less than $1000 for huge lofts. Why would they move? So most of the original artists remain. Believe me on this, as a 30-year resident. I fear you believe the hype perpetrated by Real Estate reporters who, without doing a shred of investigation, assume there are no artists left. Don't believe the hype. I personally know scores of artists. Even many of the new residents are artists. Either successful artists, or, more commonly, one spouse has a nice-paying gig, and the other spouse is an artist. The Landmarks Commission and other groups realize the distinction, both regarding the buildings, as well as the zoning, cultural, historic and demographic distinctions. People who call the area east of West Bdwy (Thompson, Sullivan, etc.) as 'SoHo' are generally those who do not bother with distinctions in neighborhoods (a foolish thing in a city of neighborhoods), or unscrupulous landlords who attempt to fool newbies to the city by charging the same rent for six-floor walk-ups in the South Village as fab lofts in SoHo. Minetta Tavern unveiled their new "old" facade today. and it looks pretty classy I must say. How literal you are, FlyOnTheWall. When I wrote that artists decamped for Chelsea, I meant that the galleries that show the artists decamped for Chelsea—which they most certainly did. Obviously, artists LIVE is Soho, as they do in every neighborhood of NYC. As for being geographically challenged, I admit including Ear Inn was a stretch. Beyond that, I stand by the survey. I would cut off Soho at Sixth Avenue, not W. Broadway. What would you call those extra blocks? Finally, Soho vs. SoHo? Honestly. Technically, you're right. But who cares? Do you think people thought I was talking about London? It's like being upset when people call Grand Central Terminal by the name Grand Central Station. You're right, but give it up. By the way, the original location of Dean and Deluca was 121 Prince Street, near Greene Street. SoHo is defined either by its landmarking or by its zoning, both of which more or less overlap. The historic landmarked district extends from Crosby to West Bdwy. The zoning district - manufacturing by the way - extends from Lafayette/Centre to just slightly beyond the west side of West Bdwy. So, SoHo's western border is delineated at West Bdwy. "What would you call those extra blocks?" The neighborhood to the west of West Bdwy, is R zoned (residential) not M zoned, and has always been considered by SoHo residents and old timers, - as well as by the the ethnics who have long resided here, the Italians and Portugese - as Greenwich Village, or, more precisely, the South Village. I recall them referring to the area to the east of W Bdwy as SoWhat. It cetainly wasn't their neighborhood. There used to be lots of friction back in the day between the Italian corner boys and the artists, with the occasional beating. Guess who beat on whom? The point is, those who live here more than a few years clearly know the difference between the two neighborhoods, architecturally, demographically, culturally, educationally, etc. There is a great book from 1977 by a New School doctoral student, Joseph Tricarino, "The Italians of Greenwich Village", recounting in anthropological terms his several years of residing around Prince and Sullivan Street. He had an entire chapter devoted to the areas to the west, which was becoming known as 'SoHo'. As I said, the blurring of the borders was at the hands of the real estate industry, who wanted to sucker people to pay high SoHo rents for tenement apartments. You think kids from Portland would know the difference? As far as the upper case 'H', fine, it's your blog. But accuracy never hurt. Refer to e.e. cummings on that matter. Or do you write E.E. Cummings? Trivia about the Ear Inn is that it was perched on the original waterfront, before landfill expanded the shoreline west by a couple of blocks. You can still see an original metal mooring (?? sorry I don't know if that's the proper nautical term!) that ships used to tie up to. Makes you realize how much bigger this island has literally become. Right you are, Carol, about D&D. And the Earth Room indeed deserves a reference. FlyonTheWall: I'm going beyond the landmarked district. If I just stuck to landmarked districts, I would have had only two blocks to work with in Carroll Gardens. A neighborhood is more than its landmarked district. The vaunted AIA guide takes its survey of Soho to Sullivan Street on the west side. And the authoritative Encyclopedia of New York City defines Soho as being bordered on the west by Sixth Avenue. So there's some room for debate here. I have a couple dozen guides to NYC on my shelf. Some say SoHo, some say Soho. But I give it to you: historically, you are right. If we're to be strict, it's SoHo. (Though I'm sure this would be news to much of the citizenry.) In deference to accuracy, I will change the spelling throughout the guide. Thanks for the references. Like boundaries of countries, boundaries of neighborhoods can change. Actually, the area to the west of Sixth Avenue, where the Ear Inn is located, many call "West SoHo", instead of Trinity Real Estate's preferred "Hudson Square", which locale was originally located in the 19th c. down by the current exit plaza of the Holland Tunnel in TriBeCa. Since it shares a similar M-zoning as core SoHo, it seems more appropriate to refer to it as West SoHo. Few neighborhoods are landmarked, but all are zoned. Zoning defines use and that is a good way to define a neighborhood. Yeah, neighborhood names change. The term 'West Village" never existed in 1960, but now it is moving from its original approximate boundary of Hudson Street over to Seventh Ave and this week a newspaper placed a shop on Sixth Avenue as being in the West Village. So we have the East, West, and South Village. Where is Greenwich Village? This is occurring city wide. South Brooklyn is now called the South Slope, and recently the media is referring to what we called 'Flatbush', as "East Flatbush", demanding the question, "Where is West, North, and South Flatbush"? Maybe that would be a nice future topic for Lost City: Lost Names of Neighborhoods. I'd like to see an attempt at a more rigorous definition of neighborhoods. I think the problem in New York is that you have microneighborhoods and macroneighborhoods. Microneighborhoods are small areas, usually with around 30,000 to 40,000 people, where if you live there, your grocery store, school, church, "neighborhood restaurants", drycleaners, etc. are al located there, all within a few blocks of where you live. A macroneighborhood is a collection of microneighborohoods that share the same character, usually within very well defined boundaries. Boundaries of microneighborhoods change and usually only residents know where they are. Boundaries of macroneighborhoods tend to be constant and are more familiar to outsiders. Guidebooks will refer to macroneighborhoods, unless the microneighborhood is really famous, as is the case many downtown Manhattan neighborhoods. For example, the area east of Central Park, between 60th and 96th Streets is referred to as the "Upper East Side", but the microneighborhood "Upper East Side" definitely does not extend east of Lexington Avenue, I'm not sure what the northern and southern boundaries areas. There are other, fairly unknown microneighborhoods within the macroneighborhood "Upper East Side". "SoHo" is a functioning microneighborhood, but visible only to its residents. There is a macroneighborhood in the once bohemian area west of lower Broadway that doesn't have a name, maybe it should be called "Soho". For a pint and atmosphere after wandering the neighborhood for a while, I'd have to throw Toad Hall into the mix. It has an interesting mix of traditional pub and SoHo sheen. I spent many a night there in the early to mid nineties. thank you Fly! it's "SoHo," not "Soho." As a SoHo native (born in 1983 on Varick, and later lived on Greene), I always cring at seeing it spelled "Soho." However, I've always considered its border to be sixth ave, not west broadway, and obviously recognized the distinct differences but felt it was still the same hood. South Village seems fairly accurate though as it feels somewhat the same as GV and was populated by the same mentioned Italian & Portugese...Ever seen the Mickey Rourke film, "The Pope of Greenwich Village"? Classic. Although the lead characters grew up on Carmine St, a lot of the scenes were filmed below Houston-one scene especially on Sullivan St. where they walk from Pino's to the cheese store, to the bread store, just to make a sandwich for lunch. Now that's the SoHo (er South Village) I remember. I think the problem is that when SoHo was named such, it was defined by Houston, therefore that area west of west bway gets severed from the Village and absorbed into SoHo. whatever, nothing is the same there anymore anyway. SoHo used to be a cool place to be from, now I am almost embarassed to say I grew up there for fear of all the ignorant non-NYers who have ravaged, raped and drained our city of its real culture, thinking I'm some rich snob. SoHo used to be gritty and dangerous at night. I loved that SoHo. Its sad what NYC has become. Hopefully the real estate slump will allow the artists to come back to downtown Manhattan again. btw I consider the E/W boundaries of "Greenwich Village" (proper) to be Seventh ave and the Bowery, but who cares? Its all the Village to me. Does anyone remeber Oh Ho So - one the early restaurants in SOHO? I remember Oh Ho So--I worked for Mrs Lum, the owner, at her other restaurant in mid-town and some of the staff moved back and forth between the two restaurants. I loved working with the large raucous crew: as it was my first job after college, it was my introduction to restaurants and to life in general. Sadly, many of the guys I worked with died of AIDs in the mid eighties. By the way, Mrs. Lum lived in a huge loft on West Broadway, which I, and my parents who lived in SoHo in the sixties to early seventies, considered the western boundary of neighborhood. I don't remember what we called the area from West Broadway to 6th Ave south of Houston but it wasn't the Village and certainly not South Village. We didn't even specify streets, I just would say I'm going out for some coppacol and my mother would know I was going to Sullivan St.
Now with all the Italians gone and everything so homogenized down there I would have to agree that SoHo's boundary runs to 6th Ave. I recently read Tricarico's book and found it to be like an overly long dissertation. Perhaps it was. He refrained from naming anyone or thing from the live poultry place on Thompson to Anthony Dapolito ("community broker"). So it makes for rather dry read. Was he scared the Thompson St. boys would come get him? This book is always cited when talking about SoHo history but are there any other books that are recommended? I also worked at OH HO So as well as Dish of Salt. We had a fun staff at OH HO SO! I was Maitre D along with Mary Ann's Brother. This is Mel. A lot of us went out on the town after work. We got a lot of famous people in there. Fond memories. This part of the city is my favorite! I wish I was able to afford a place here.